Shane Van Boening has defeated Jung Lin Chang to claim the 41st U.S. Open 9-Ball Championships. Chang opened up his quest for his first U.S. Open title with a break and run. Then, after Van Boening missed in rack two, Chang ran out again. And he follow this with a long thin cut on the 1-ball and ran out to take a 3-0 lead. Then it was Van Boening’s turn to show off his firepower, and he did with a run out after Chang missed a tough cut. Van Boening then broke and ran out, broke and ran out, and broke and ran out again to take a 4-3 lead. On the last one he slammed home a long rail bank on the first ball after first considering playing safe. After Chang missed a tough shot, Van Boening ran out again to move ahead, 5-3. Chang broke the streak with a win, but then scratched on the break and Van Boening ran out, then broke and ran yet another rack to take a three game lead, 7-4. After he missed a bank, Chang pocketed a 4-9 combo. He scratched on the break and Van Boening ran out again. In game 14 Van Boening played an okay safe, but Change jumped over the blocker, made the ball, and ran out. But he scratched on the break and Van Boening ran out, then broke and ran out for the fifth time to move ahead, 10 games to 6. In the 17th game, Van Boening scratched on the break and Chang ran out to pull to within three games, 10-7. Next came a break and run as Chang closed the gap to two games. At this point, Van Boening’s TPA was .946 while Chang’s was .937 – which was an indicator of their superlative play. After they traded misses on tough shots Chang made yet another jump shot and ran out to close to within a game. But he failed to make a ball on the break and Van Boening ran out to lead after 20 games, 11 to 9. In game 21 Van Boening separated an 8-9 cluster on the last ball before it, got good shape, and completed his sixth break and run out to reach the hill leading 12-9. Van Boening’s break was illegal (he failed to drive three balls past the side) and Chang had his last shot. 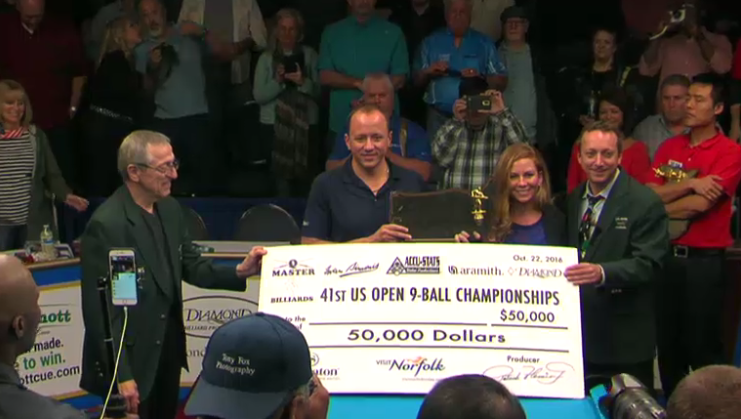 But he lost position on the 5-ball on a combination, missed a super thin cut, and Van Boening ran the final five balls to capture his record tying fifth U.S. Open title! Jayson Shaw opened with three wins in a row, then broke and ran to take a 4-0 lead. A combo after the break on the 9-ball and a tough 2-9 combo in the next game staked him to a 6-0 lead. After he scratched on the break, Van Boening ran out, then broke and ran out. The score: 6-2. After Shaw missed a bank in game 9, Van Boening ran out, then won two more to make it five straight wins. At this point Shaw’s lead had been cut to a single game. They traded the next two games, then Shaw won two more, the second coming with a long rail bank after Van Boening blew his shape on the 8-ball and missed a tough cut. Shaw now led, 9-6. In game 16 Shaw scratched on the break and Van Boening ran out. 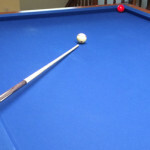 He then piled on three more break and run outs before capping off his comeback with a match winning 9-ball on the break. 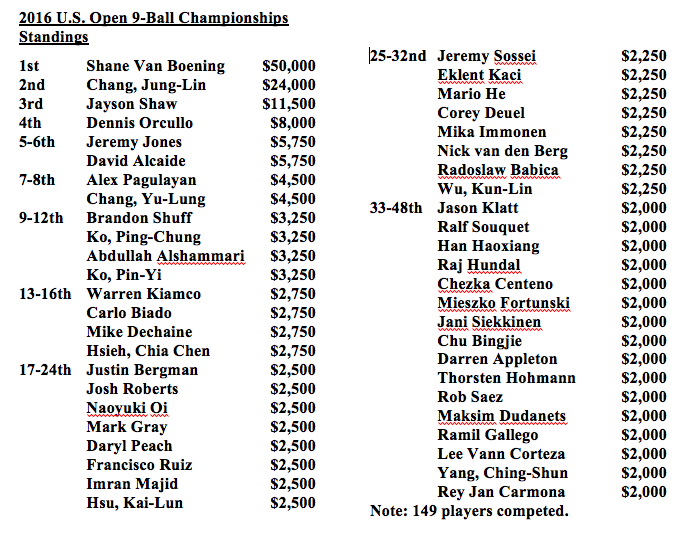 Shaw finished third in this field of 152 players while Van Boening has earned a rematch with Chang, who had sent him to the one-loss side early in the week. Chang rocketed to a 9-3 lead on the strength of his nearly flawless play and two unforced errors by Shaw. In game 13 Shaw slammed in a bank and ran out, then missed a long shot in the next game and Chang ran out to reach the hill with a lead of 10 games to 4. In the 15th game Chang failed to make a ball on the break, and Shaw erupted! He ran out, then broke and ran out to close the gap to 10-6. At this point Chang’s TPA (Accu-Stats) was .958 while Shaw’s rose to .918. 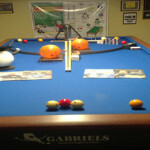 In game 17 Shaw missed, got safe, then made a long shot with the cue ball in the jaws and the object ball near the center of the table (see photo). He ran out, then made a ridiculously tough combo in the next game and ran out again to close to within two games at 10-8. Two more break and runs followed and the match went to double hill! In the final game Shaw made a couple of balls on the break but missed a long thin cut shot. Chang wisely took a break, composed himself, and ran out to advance to the finals. Shaw will play Shane Van Boening in the semi-finals. In a match that ended earlier Van Boening cruised to an 11-5 win over Dennis Orcullo. Orcullo had won nine matches in a row, and he finished fourth in this super deep field of world beaters.